Back in February, I wrote a blog that was a bit of a love letter to our three hens. Today we planted our tomatoes, so the love story has, sadly, come to a screeching halt. This year’s tomatoes went into one of two raised beds, which have sat fallow for two years. 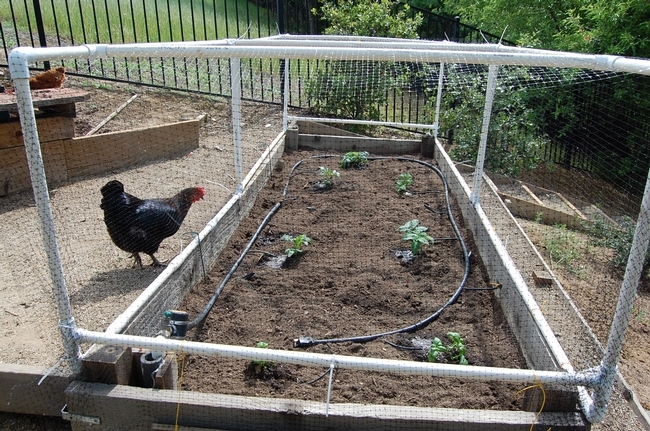 I have always had to create a “dome of protection” with bird netting over the raised beds, as they abut a large open space where coveys of hungry quail lurk. And now we have to worry about our hens raiding the garden boxes, too. Bird netting is hateful stuff. It catches on everything — branches, leaves, earrings, eyelashes. We wanted to make our lives easier, when it comes to bird netting, by building semi-permanent frames onto which we could wrap netting. I found a thorough online description for building PVC frames, and the construction began. Our two raised beds are 4 feet by 10 feet. We started out making one rectangular frame to fit over the top of the beds. This was unwieldy to build, and would be too heavy and wobbly to move out of the way for harvesting and such. My husband decided to construct two frames, 4 feet by 5 feet each, and they went together much more easily. The beauty of two frames is they’re light. I can raise one half of the cover to harvest, add mulch or pull weeds. Knowing how tall indeterminate tomatoes can become, we plan to make two more frames that will stand taller. For now, the 3-foot height is fine. Our hens are a bit miffed. They saw us put in the tomato seedlings this morning, and rushed over to gobble up those sweet new leaves. After much shooing and distracting with fresh, wormy piles of compost thrown their way, my husband and I were able to cover our new plants with our new frames. I’ll keep you posted on how well they work. 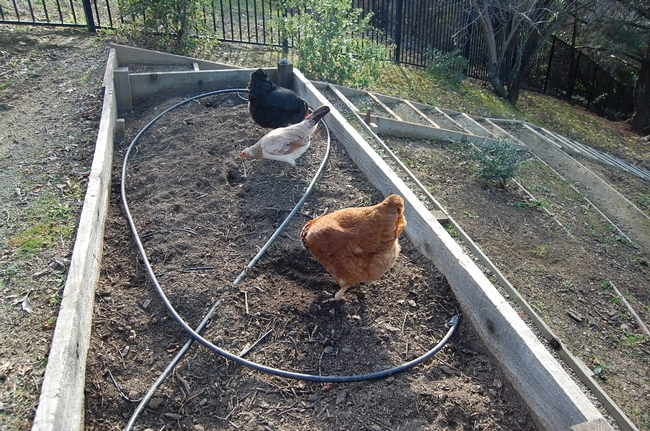 The newly planted bed, with new bird-netting frames, is no longer as welcoming to the hens and local quail.